I’ve heard about this phenomena called vegan lox, and did some research by watching a few videos on this. I decided to try my hand at making my own base recipe. Being born in Scandinavia I have a few different salmon dishes from my childhood to think back on to recreate. I’m using the saltbaking method. I’m also experimenting with a steamed version. I’ll keep you updated on that one. I’m going to make the perfect version for Christmas with a real melt in your moth texture with a smokey finish. This vegan smoked “salmon” is actually quite perfect on the vegan Christmas table or for a brunch. 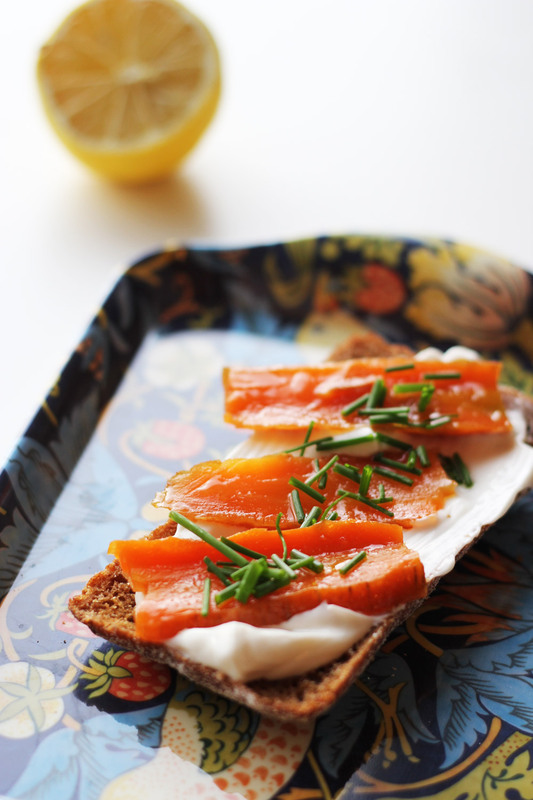 In the picture above I’ve served it true Scandi style on a rye bread, with vegan Crème fraîche, topped with fresh lemon juice and chopped chives. Delish! Wash and dry the carrots. Add a layer of salt to a ceramic or other oven safe dish. Place the carrots on top of the salt and pour over more salt until the carrots are completely covered in salt. Place the carrots in a pre-heated oven (175C), and bake for 75-90 minutes depending on the size of the carrots. Once the carrots are baked, take them out of the oven and let cool off for a while before you remove them from the salt. Remove all excess salt on the carrots. Mix the ingredients for the marinade, and if you use a kelp knot, add it to warm water and let it expand and soften. Slice the carrots in thin strips. Place the carrot strips in a container, add the kelp knot and pour the marinade over the carrots. Place in the fridge and marinate for at least 2 days before serving. Add dried or fresh dill to the marinade for that true Scandi taste.